Our mission is to develop community awareness and support for the urgent need for habitat connectivity for barrier-free migration for mule deer and elk. We are a registered nonprofit in partnership with the Oregon Wildlife Foundation (OWF), the Oregon Hunters Association (OHA), the Oregon Department of Transportation (ODOT), the Oregon Department of Fish and Wildlife (ODFW) and the Forest Service of the Deschutes National Forest. Through presentations to community groups, we provide fact-based information on the growing barriers to migration. Reported animal-vehicle collisions in Deschutes County are 1000 a year. Unreported collisions are estimated to be as high as 5000 a year. These have severe consequences for wildlife and for the regional economy in direct and indirect costs of millions of dollars. Each collision costs motorists $6500 and thousands of dollars in public costs. There are significant losses to the regional and state economy from the impact on ecotourism and the hunting community. 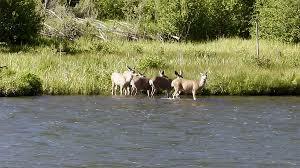 Wildlife unfriendly fencing is another barrier that injures and kills hundreds of mule deer and other species a year. There are often mitigating solutions for this. The continued loss of habitat in summer and winter ranges puts the survival of species like mule deer and elk at risk. Protection of habitat and connectivity between habitats is urgent. We share information on solutions to barrier-free migration that are successful in other states, the need for wildlife crossings that reduce collisions by 85 - 95%, and mitigations for wildlife that can be built into the continued growth in development and recreation. We believe that once informed, the community will devise the best solutions for Deschutes County. That is our mission.